Joint HealthFitMax Flex Fit - 120 tabl. 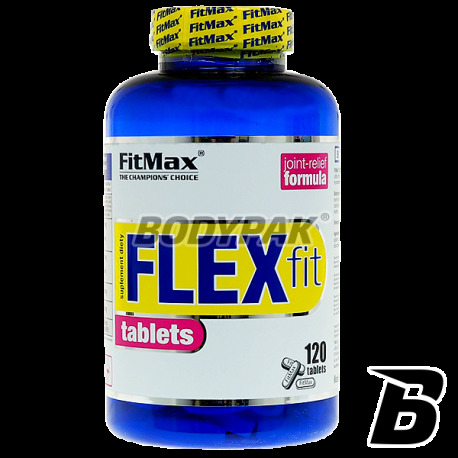 FitMax Flex Fit - 120 tabl. Compound which includes 2KCl glucosamine sulfate, chondroitin sulfate, an extract of Boswellia serrata, hyaluronic acid and vitamin C. Effectively supports the reconstruction of articular cartilage! 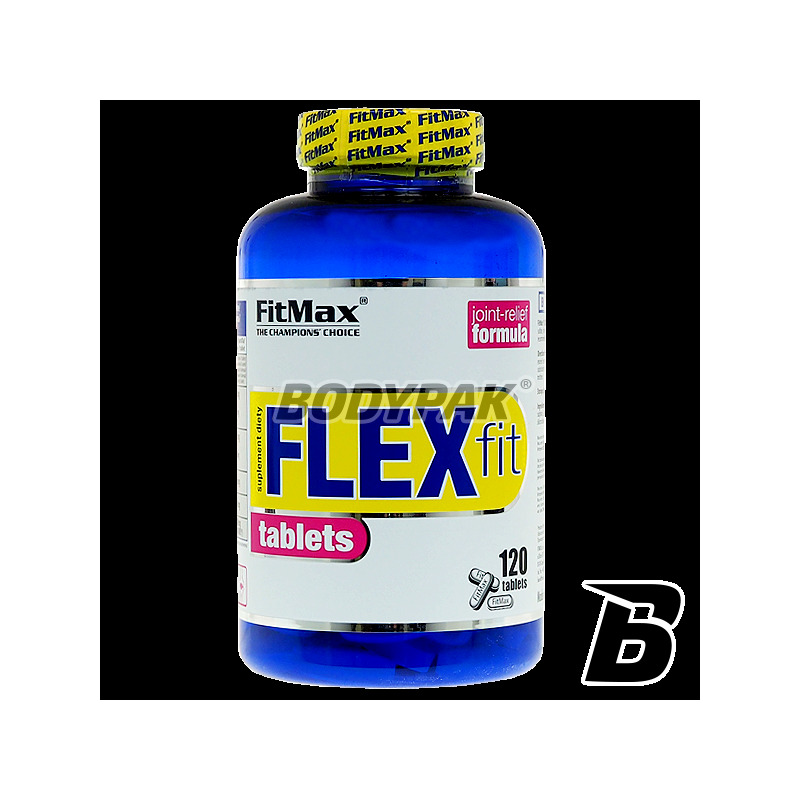 FitMax Flex Fit, the tablet is a multi-center which includes 2KCl glucosamine sulfate, chondroitin sulfate, an extract of Boswellia serrata, hyaluronic acid and vitamin C. They recommended in particular to those physically active. Chondroitin is one of the major components of articular cartilage. It mukopolisaharydem plays a central role in the production of proteoglycans that are part of the extracellular matrix. With the mechanical properties of this substance, it is possible to cushion the forces acting on the joints. The result is easier to perform movements. Chondroitin sulfate restores tissue and its water-binding properties have significant impact on the shock absorption are subjected joints. Chondroitin has a very good influence on the efficiency and durability of the joints and in conjunction with glycosamino guarantees to increase the resilience of both joints and bones on micro-. Glucosamine is a naturally occurring amino sugar in our body. Part of the primary substance responsible for the proper functioning of joints. It also occurs in small amounts in the diet. The richest sources of glucosamine are: crawfish, shrimp, crabs and clams. In a period of increased physical exertion, increased load carrying joints, the overweight and the elderly is a reduction in the production of glucosamine by our body. During these periods, particularly important becomes the alignment of its scarcity. Glucosamine reinforces joints and stimulates collagen synthesis delivering its larger quantities to allow for reconstruction and regeneration of articular cartilage. It also protects the tendons, ligaments, joint capsules, and bone tissue. It is recommended that both during recovery and in prophylaxis. Improves the mobility and flexibility of joints. In addition, anti-inflammatory and analgesic effect and also prevents decalcificated bones. The most effective variety is glucosamine sulfate. It is characterized by a very high bioavailability as 98% of the oral substance is absorbed into the bloodstream. Sulphated glucosamine potenguje therapeutic effect. Regular supplementation with glucosamine sulphate strengthens joints preventing their injuries during heavy load which eg. The result of strenuous exercise as in sports, both amateur and professional is a great asset. Hyaluronic acid is determined not only by firm and smooth skin, but also is a major component of synovial fluid and acts as a "lubricant" when moving. Its main function is to control the water content in the intercellular tissue. Boswellia serrata - extracts of Boswellia serrata in clinical trials have demonstrated efficacy in the treatment of osteoarthritis, it (in knee osteoarthritis), some sources also show the positive effects of w / w rheumatoid arthritis, asthma, and ulcerative colitis and Crohn's disease. They are also conducted trials with boswellic acid for the treatment of cancer. The sports supplementation extracts of Boswellia serrata is used mainly in assisting the prevention and treatment of sports injuries, arthritis when overload during the period of rehabilitation. Usually recommended to be used in combination with glucosamine, chondroitną, vitamin C, collagen, ginger and other agents intended to assist the functioning of the apparatus. It has been proven that the acids boswelliowe a pronounced anti-inflammatory activity comparable to the anti-inflammatory effects of ibuprofen. Reduce catabolic processes of the connective tissue and protect the articular cartilage from the destructive effects of certain enzymes. Improve blood supply to the joints affected by arthritis. These effects lead to a significant improvement of clinical !!! Especially to reduce swelling and morning stiffness to relieve pain, improve joint mobility and reduce corticosteroid therapy, and thus to improve the overall quality of life. FitMax Flex Fit - effective and available without a prescription. Use 1 tablet 1 time a day. Jak na swoją cene to bobrze spełnia swoją funkcję, brak bólu stawów. Proper regeneration of joints and of the musculoskeletal system is an extremely important element for the health and well-being! Counteract possible injuries, and enter the formula for permanent supplementation!